NEW YORK (CNNfn) - In a stunning development, America Online Inc. announced plans to acquire Time Warner Inc. for roughly $182 billion in stock and debt Monday, creating a digital media powerhouse with the potential to reach every American in one form or another. With dominating positions in the music, publishing, news, entertainment, cable and Internet industries, the combined company, called AOL Time Warner, will boast unrivaled assets among other media and online companies. The merger, the largest deal in history, combines the nation�s top internet service provider with the world�s top media conglomerate. The deal also validates the Internet�s role as a leader in the new world economy, while redefining what the next generation of digital-based leaders will look like. The deal, if approved, calls for Time Warner shareholders to receive 1.5 shares of the new company for every share of Time Warner stock they own. AOL shareholders will receive one share of the new company for every AOL share they hold. The new company will be 55 percent owned by AOL and 45 percent owned by Time Warner. The combination will immediately boast a market capitalization of $350 billion and an annual revenue stream topping $30 billion. More importantly, it provides AOL, which already boasts more than 20 million subscribers through its AOL and Compuserve Internet services, high-speed broadband access to Time Warner�s more than 13 million cable subscribers, further reinforcing its position as the nation�s top online provider. In return, Time Warner -- parent company of a broad range of media outlets, including Warner Bros. Studios, HBO, CNN, Warner Music, Time magazine and CNNfn.com -- gains a powerful national and growing international platform upon which to distribute and promote its sizable products. "I don�t think this is too much to say this really is a historic merger; a time when we�ve transformed the landscape of media and the Internet,� said Steve Case, AOL�s chairman and chief executive officer. "AOL-Time Warner will offer an incomparable portfolio of global brands that encompass the full spectrum of media and content.� (508K WAV) (508K AIFF). In fact, Case said it�s hard to imagine a home in the United States that is not touched by Time Warner or AOL in some way, be it television, movies, music or the Internet. Analysts noted the deal also represents a fundamental shift in not only how content providers will be structured in the new digital economy, but how online companies are valued in the future. The deal is significant in that although AOL -- a company formed by Case after he grew tired of developing new pizzas for Pizza Hut -- just recently began turning a profit, it boasted a much higher market capitalization than Time Warner, formed exactly 10 years ago through the merger of Time Inc. and Warner Communications. So while Time Warner will initially provide roughly 70 percent of the combined company�s profit stream, AOL actually will control a greater stake of its stock because of how highly Wall Street values the growth potential of the Internet. "Today�s announcement really does change the tectonic plates in this world,� said Christopher Dixon, media analyst with PaineWebber. The offer from AOL, which entered Monday with a market value of more than $163 billion, values Time Warner at $164.75 billion, about double the company�s $83 billion market capitalization at the close of market trading Friday. When roughly $17.2 billion in Time Warner debt is added to the equity value, the $181.95 billion offer ranks as the most expensive buyout in corporate history, far surpassing Vodaphone Airtouch�s $148.6 billion cash and stock offer for Mannesmann late last year. Time Warner (TWX) shares soared on the news, climbing as high as 102 Monday before settling in up 23-3/8 at 93-1/8 by mid-afternoon. AOL (AOL) shareholders provided a more mixed reaction, bouncing the stock from positive to negative territory all day. By mid-afternoon, AOL shares lost 3/8 to 73-3/8. The deal also pushed several other media and technology companies� shares up, as investors began guessing where the next mega-deal might take place. "How you�re delivering content and what you�re doing to reach your customers, that�s changing daily, and I think it would be foolish not to expect a lot more merger activity going forward,� Doug Cliggott, a technology analyst with J.P. Morgan, told CNN. (508K WAV) (508K AIFF). Time Warner boss Gerald Levin is slated to become chief executive of the new company, while Case, who said he first approached Levin about such a merger in October, will serve as its chairman. The companies said both boards already voted unanimously in favor of the deal, which company officials hope to finalize by the end of the year. 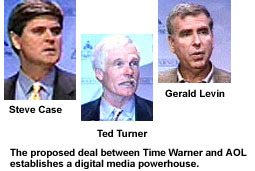 Ted Turner, Time Warner�s vice chairman, will serve in the same capacity in the new company. Turner, who currently controls 9 percent of Time Warner�s stock, has agreed to vote in favor of the deal. (508K WAV) (508K AIFF). While some experts speculated it may be difficult for Time Warner and AOL to merge their corporate cultures, Case, Turner and Levin expressed confidence they can overcome any obstacles. Wearing a tweed jacket without a tie, the normally button-down Levin even joked about the different cultures. "It gives me great pleasure to welcome the �suits� from Virginia here to New York. Case, wearing a dark suit, said the areas of responsibility are clear. A Time Warner source said the two sides entered serious negotiations about two weeks ago before striking a deal over the weekend at Cravath,� Swaine & Moore, Time Warner's law firm. Neither side expects significant regulatory opposition to the deal, although each municipality served by Time Warner�s cable system will have to approve the deal because there is a change in ownership. Analysts did question how regulators would view any attempts by Time Warner to give AOL exclusive access to its cable lines, but press officials from the Federal Communications Commission, U.S. Department of Justice and Federal Trade Commission all declined comment on the deal. Company officials emphasized the deal�s ability to accelerate the combined company�s revenue stream while generating significant efficiencies on the advertising and marketing end. "So to me, I saw the power of that combination and as I looked around and looked at other companies and other opportunities, it really came down to there�s only one combination,� Levin said. "So I concluded that either we would do something with AOL or we would build ourselves, but this is infinitely preferable.� (508K WAV) (508K AIFF). To highlight the point, AOL and Time Warner also announced several joint initiatives Monday. AOL will now feature Time Warner�s CNN.com, Entertaindom.com and InStyle magazine content on its service in addition to providing access to a wide range of Time Warner promotional clips. In exchange, Time Warner plans to make a number of promotional offers available to only AOL members in addition to dramatically expanding the cross-promotion of AOL in a number of its offline media properties. Analysts said the merger could immediately plant the seeds for future mega-deals among media companies and a growing number of online service providers. Ehrens said the company most likely to deal next is Yahoo! Inc. (YHOO), which draws more than 35 million visitors to its site each month, offering media firms unparalleled access to the online world. Microsoft Corp. (MSFT) also will feel some heat from this deal as it struggles to encompass significant media content into its range of technology products. 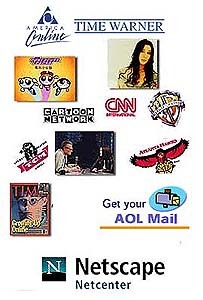 Click here for a chronology of key events for Time Warner and AOL.